Westwind Memory Care offers a few floor plans to give residents options when it comes to finding their new home. Private suites offer 312 square feet, while companion suites provide enough space for two people, with 330 square feet. Whether you or your loved one chooses a private or companion suite, your new home will offer the same excellent features. 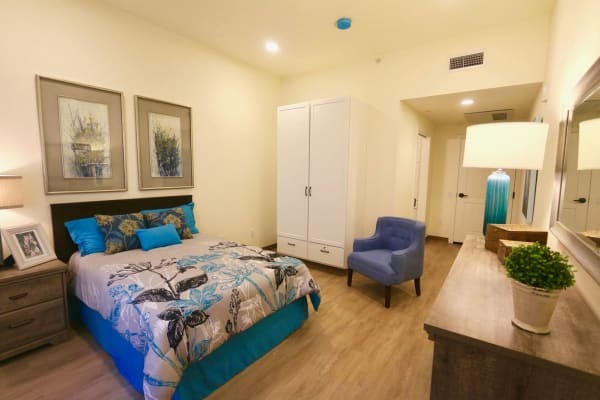 Each suite includes central air conditioning to keep residents comfortable. Gorgeous features like granite countertops and custom cabinetry to heighten each home’s aesthetic. A bathroom in each suite includes an accessible shower, so residents have the privacy they want, with the option for assistance when needed. Our luxury Memory Care suites in Santa Cruz, CA, are as beautiful as they are homey. Recessed lighting sets the tone for warm, relaxed living. Residents seeking company and friendship will love our companion suites, while those who enjoy more independence or solitude can take advantage of our private suites. Ready to see Westwind Memory Care floor plans in person? Call today to schedule your tour.